Direct mail is an extremely powerful advertising tool, that helps businesses prospect for new customers, increase brand awareness and maintain strong customer relationships. Despite a plethora of available advertising channels , and the myth that direct mail is on the decline, the numbers prove otherwise. 79% of Consumers act on direct mail immediately when they receive an offer, versus only 45% who act immediately to email offers. Is your business using Direct Mail Marketing? 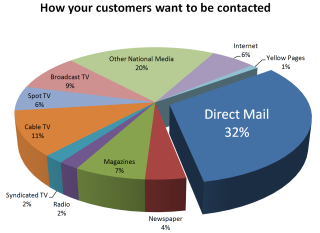 According to a recent study by Catamount Marketing, “How your customers want to be contacted”, 32+% of people surveyed, prefer to be contacted by Direct Mail over all other forms of communication.